An ultrasonic transducer creates a vibrating blade, enabling the cutting edge to more easily slice through a wide range of materials – thin plastics sheets, rubber, paper products, woven and non-woven materials, and even carbon fiber pre-preg. Available models are designed around hand-held pieces, or mountable transducers for use with industrial robots, plotters, and automated machinery. 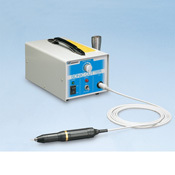 Please contact us for a free sample test cut to select the model ultrasonic cutter best suitable for your needs. The NSK Nakanishi Sonic Cutter system is an excellent, low-cost system capable of cutting a wide variety of paper goods, plastics, leather, and woven materials. The Sonofile ultrasonic cutting systems utilize more powerful control units designed for heavier-duty and continuous-use cutting applications. Sonofile® ultrasonic units are designed to be integrated into manufacturing applications, such as with robotics and automated equipment, or used as a tool for cutting and deburring. On/Off operation and amplitude changes can be performed from the remote controls. 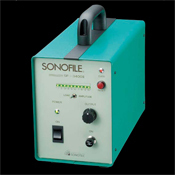 The Sonofile® cutters can output error signals, such as overload notifications. (Specifications vary according to the model). Ultrasonic cutters can also be used easily as a hand tool; click on the link to the YouTube video demonstration below.